William Green (1870-1952), one of the outstanding American trade union leaders of the twentieth century, served as president of the American Federation of Labor from 1924 until his death in 1952. Established in 1886, the American Federation of Labor is an umbrella organization for other unions. In 1881, Samuel Gompers took the lead in organizing the Federation of Organized Trades and Labor Unions of the United States of America and Canada. This organization became the American Federation of Labor (AFL) in 1886, in Columbus, Ohio. Many members of these two groups were disgruntled members of the Knights of Labor, the most influential organization of unions in the United States during the 1870s. Gompers served as the AFL's first president. He remained the organization's president, other than for one year, until his death in 1924. Under Gompers's leadership, the AFL became the largest labor union organization in the United States. The AFL initially allowed only skilled workers to join the organization. Unskilled laborers initially did not have representation under the AFL. The group also originally prohibited women, African Americans, and other racial minorities from joining the organization. Gompers supported the use of strikes, but he preferred peaceful negotiations to attain fair contracts for workers from their employers. He also sought to keep the AFL out of the political arena, believing that political activity might offend some business owners and hinder the workers' ability to attain better conditions. By 1904, the American Federation of Labor had 1.7 million members. The organization's membership soared during World War I, as the federal government granted numerous concessions to workers and unions. As the United States was engaged in a world war, the government hoped to avoid strikes by intervening on the behalf of workers with their employers. In 1920, AFL membership had soared beyond four million workers. Unfortunately for the AFL, the 1920s and 1930s resulted in new difficulties for the organization and its leadership. Some members began to call for a more inclusive organization -- one that would fight for the rights of unskilled workers as well, rather than just workers skilled in a particular craft. Tensions over this issue became so prevalent that, in 1935, John L. Lewis, an AFL member, formed the Committee for Industrial Organization. Originally, this organization was a part of the AFL, but in 1937, the parent organization expelled all members of the Committee for Industrial Organization. The Committee for Industrial Organization eventually became the Congress of Industrial Organizations (CIO). 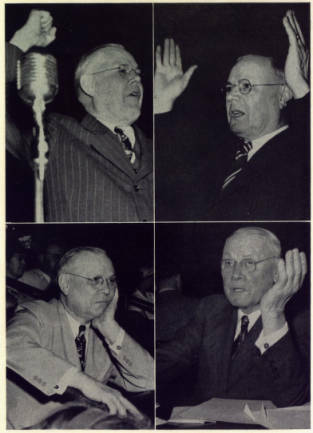 The AFL and the CIO remained as two separate organizations until 1955, when the two groups reunited together as the AFL-CIO. For the remainder of the twentieth century, the AFL-CIO remained the largest union organization in the United States. The percentage of unionized workers, however, declined beginning in the 1950s. In 1953, 32.5% of American workers were union members. By 1983, only twenty percent of American workers belonged to a union. Montgomery, David. The Fall of the House of Labor: The Workplace, the State, and American Labor Activism, 1865-1925. New York, NY: Cambridge University Press, 1989.